In truly Melbourne style, Archie Green is tucked away in a laneway. Venture in and your eyes will be greeted with a slick all-day dining venue which boasts plenty of splashes of greenery (as its name would suggests). The cuisine is bold and meticulously prepared. 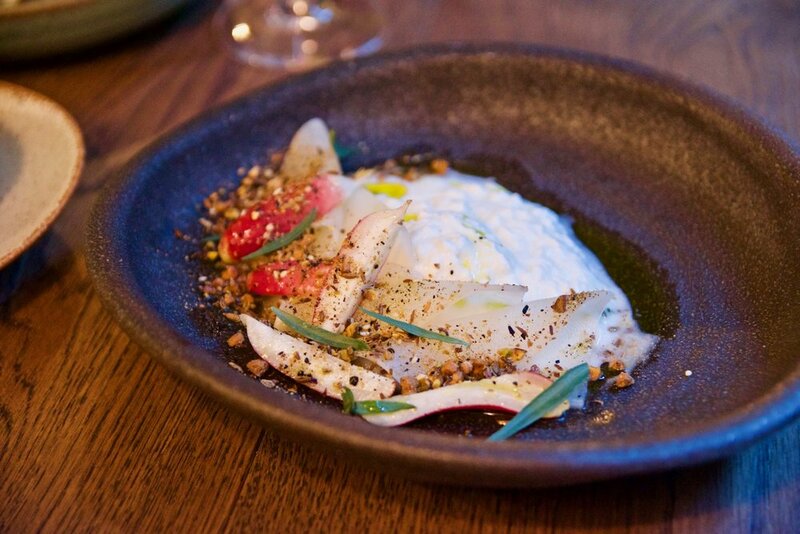 Inspired by regional produce, the kitchen delivers food with urban sensibility. The essence of the menu is the use of traditional cooking techniques in the kitchen, contemporary combinations of European and Asian flavours combined with a selection of carefully selected local produce. The restaurant is ideal for indulging in libations too, laying claim to a solid cocktail, beer and wine list. Our top picks from the menu include the five spice doughnut. This golden puff was ethereal in texture, cinnamon-sugar coated and tasted delicious with the velvety and savoury chicken liver parfait and sweet agave jam. For vegetarians (and everyone else), the charred broccoli is wonderful. Perfectly cooked broccoli with yummy little charred bits were served with warm lentils, earthy king brown mushrooms, jersey feta and a flavour-laden chervil soup. For something heartier, do not go past the Grain fed Rangers Valley tri-tip steak. This is the stuff of dreams. Like most high-quality cuts, it was best cooked rare to medium. Displaying a mastery in the manner the steak were cooked, the steak was cooked perfectly from end to end. A light searing ensured that each steak was lined with a thin crisp layer packed with caramelised beef flavour. The addition of white anchovy and caper jus took the steak to the next level. We adored the addictive salinity of the anchovy, which, when eaten together with the steak was an absolute flavour explosion. The steak is also served with textbook perfect shallot rings for good measure. Desserts time showcases the kitchen’s versatility. We adored the playful dark chocolate and marshmallow cookies sandwiching banana, rum and raisin parfait which comes with a chocolate dipping sauce. It’s as truly as good as it sounds. Elegance and simplicity is the name of the game here and we’re definitely coming back to play.